Whether you are a non-profit, a small retailer or a large operation, having a social media presence is a must. Follow these 5 tips to ensure your business page branding is consistent, your page is accurate and a few ways to tell your story. 1) Add a recognizable profile picture. We highly recommend using your logo across all channels, like our friends at the Carbondale Chamber of Commerce. You’ll want to pick a profile picture that’s easy for your audience to recognize — anything from a company logo for a big brand, to a headshot of yourself if you’re a freelancer or consultant. Being recognizable is important to get found and Liked, especially in Facebook Search. It’s what shows up in search results, pictured at the top of your Facebook Page, the thumbnail image that gets displayed next to your posts in people’s feeds … so choose wisely. When choosing a photo, keep in mind that Facebook frequently changes its picture dimensions, which you can find at any given time here. 2) Choose an engaging cover photo. 3) Add a call-to-action (CTA) button. Since Facebook first launched the feature in December 2014, the options for brands to add call-to-action buttons to their Facebook Page’s have vastly expanded. These are things like “Watch Video,” “Sign Up,” or “Book Now” — and each can be customized with a destination URL or piece of content of their choosing. The ReStore encourages prospective buyers to contact the store about items or general questions with their Contact Us button and Send Message option. It’s a great way for marketers to drive more traffic to their websites, or to get more eyeballs on the Facebook content they want to promote. This is a great way for marketers to drive traffic from their Facebook Business Page back to their website. Check out how ReStore Roaring Fork Valley uses both the “Contact Us” and the “Send Message” button in this way, to make it easier for viewers to ask questions about something special they see or questions they might have. 4) Fill out your ‘About’ section with basic information, and add company milestones. We’ve arrived at one of the most important sections of your Facebook Page: the ‘About’ section. Although visitors no longer see a preview of your “About” text when they land on your page — instead, they have to click on the “About” option on the left-hand column next to your content — it’s still one of the first places they’ll look when trying to get more information about your page. 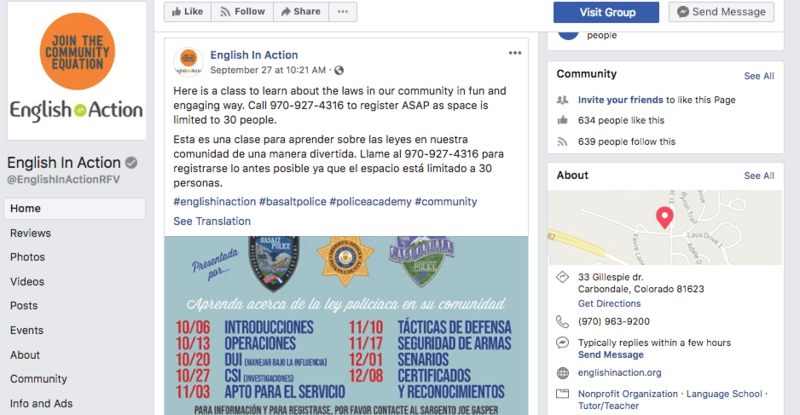 Our friends at English In Action, a non=profit that helps non-English-speaking adults learn to speak, write and read Engligh through mentorship programs, have done a great job on their About section. Even within the “About” section, however, there are many options for copy to add. Consider optimizing the section that best aligns with your brand — a general description, a mission, company information, or your story — with brief, yet descriptive copy. By doing so, your audience can get a sense of what your Page represents before they decide to Like it. You might also want to populate sections that allow you to record milestones and awards — like when you launched popular products and services — as well as the day/year your company was founded, or when you hosted major events. 5) Post photos and videos to your Timeline. 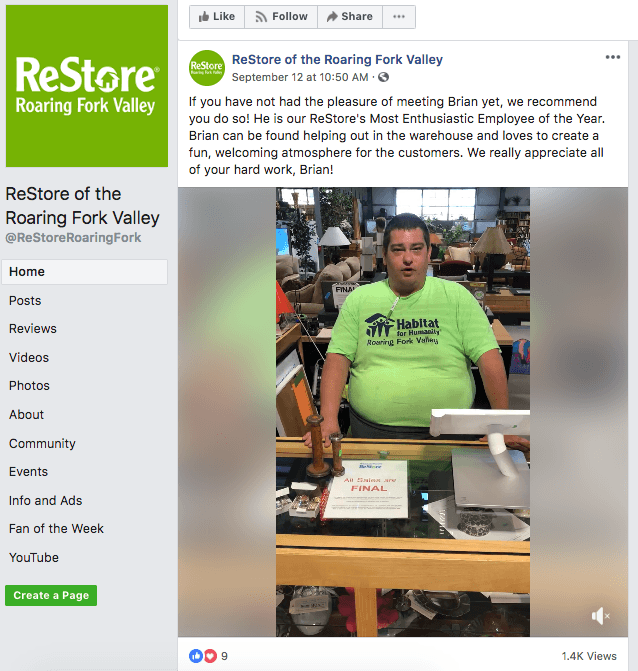 ReStore Roaring Fork Valley does an excellent job of using video to highlight one of their greatest assets: their hardworking staff and volunteers. “Watch video” is one of the CTAs that Facebook allows brands to add to their Pages for a reason — because it’s becoming one of the most popular ways to consume content. But it’s not just pre-recording videos. According to the social media channel’s newsroom, “People spend more than 3x more time watching a Facebook Live video on average compared to a video that’s no longer live.” So don’t be afraid to give viewers an in-the-moment look at what your organization does, but do make sure you’re prepared. Whether you are a veteran social media marketer or an entrepreneur getting your feet wet with social media, our team of specialists are here to help. To talk about your social media marketing strategy and to ensure you’re using the best practices to put your best face(book) forward, drop us a line.